Big data has given businesses a window into valuable streams of information from customer purchasing habits to inventory status. However, internal data streams give only a limited picture, especially with the growth of digital businesses. Gartner has identified three trends that describe information’s ability to transform business processes over the next few years. No. 1: By 2020, information will be used to reinvent, digitalize or eliminate 80 per cent of business processes and products from a decade earlier. As the presence of the Internet of Things (IoT) — such as connected devices, sensors and smart machines — grows, the ability of things to generate new types of real-time information and to actively participate in an industry’s value stream will also grow. 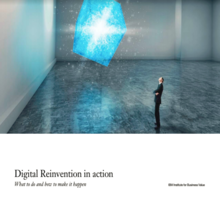 Customers, employees, and citizens will become engaged principally through digital means. With operational processes quickly becoming digitalized, traditional analog and manual processes will be automated, including both physical and human elements. Many, if not most, decisions will be algorithmic, based on automated judgment. No. 2: By 2017, more than 30 per cent of enterprise access to broadly based big data will be via intermediary data broker services, serving context to business decisions. Digital business demands real-time, situation-awareness. This includes insights into what goes on both inside and outside the organization. How do weather patterns impact inventory? More so, how do this season’s customer preferences as expressed in social media suggest greater or lesser inventory? The enterprise data available in organizations’ vaults is increasingly insufficient to provide the kind of context awareness able to support competitive digital business in marketing, transportation, financial, manufacturing, healthcare and other business decisions. However, the broad scope of externally accessible data is highly fragmented, voluminous, “noisy” and distributed. It is found in hundreds of thousands of Web and social sites, open government data, and premium data prepared by increasingly powerful data brokers. Enter a new category of business-centric cloud services that delivers data to be used as context for business decisions, human or automated. These information services (or data/decision brokers) will become an essential part of intelligent business operations and smart business decisions. Your company’s biggest database isn’t your transaction, CRM, ERP or other internal database. Rather it’s the Web itself and the world of exogenous data now available from syndicated and open data sources. No. 3 By 2017, more than 20 per cent of customer-facing analytic deployments will provide product tracking information leveraging the IoT. These sensors not only provide geospatial information (where the product is right now) but also performance information (how well the product is functioning). My new SUV is en route and currently in Arizona, or my new car is ready for its first oil change. This creates an opportunity to improve transparency and strengthen customer and partner relationships. It can become a key differentiator and a key part of your business model. Doug Laney is a research vice president for Gartner Research, where he covers business analytics solutions and projects, information asset valuation and management, “big data” strategy, and data-governance-related issues. Analytics, Enterprise Applications, Enterprise Infrastructure Big Data, Gartner Inc.